The Detroit Electric Car Company has created a new Roadster and it is called the SP:01. In a press release today, the company calls their new two-seat sports car “The new benchmark for electric car performance and handling.” That may be true, but the car looks awful familiar. Where have we seen before an electric car that looks like this and has a 0-60 time of 3.7 seconds? 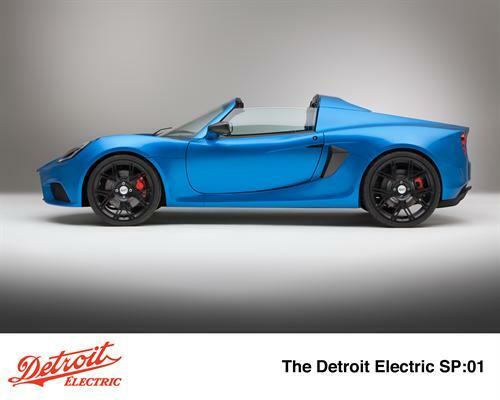 Detroit Electric says it has a new headquarters in the Fisher building in downtown Detroit. It must be really new because the phone numbers for the company start with +44, which means the person who bought that phone number did so in the UK, likely London England. That makes some sense because the new CEO of the Detroit Electric Company is the old CEO of Lotus Engineering, Albert Lam. Now we remember where we have seen a car that looked a lot like this before, the Tesla Roadster. That car started life as a rolling chassis from a Lotus Elise and this one could not look more like an Elise or a Tesla, at least to this (trained) eye. There are two giveaways that this is a car based on an Elise. First the targa roof that looks like a basket handle. Second, the whole rest of the car that looks just a like an Elise or Exige. Would it not be fair at this point to say that the Detroit Electric Company is now following in the footsteps of the Tesla Motors? How about if we tell you that the company’s plan is build a limited number of these roadsters, maybe about 999, and that, in the company’s words, “SP:01 will herald a new family of all-electric production cars, including two other high-performance models that will enter production by the end of 2014.” Maybe they could call those two new cars the Model S and the Model X. Enough with the Tesla comparisons, let’s look at the car. It has an aluminum platform and all carbon fiber body which helps keep the weight down to an amazing 2354 pounds. Although the car has only 201 horsepower and generates a surprisingly low (for an electric car) 166 foot-pounds of torque, the company claims a 0-60 time of 3.7 seconds. We could break out the calculators, but that seems remarkable. The power to weight ratio doesn’t seem to indicate a launch that fast, but we will defer to the company’s press release statement. Top speed is a claimed 155 mph. Also claimed is that the 37 kWh battery, which can be charged at home in under 5 hours, will propel the car almost 190 miles. Detroit Electric points out that estimate is based upon the “New European Driving Cycle” standard. Which is of course how cars sold in Detroit are tested – Not. This claim seems more believable than the acceleration time based on a gut feel from the numbers. The car can also power your house if the electricity goes out using the company provided home charger. For about a day if your home uses 37 kWhs per day. Then hopefully the power would come back on, or you will be stranded because your car won’t be charged up. Detroit Electric also offers a phone app to do the things electric and plug-in hybrids do nowadays, like precondition the cabin, help locate the car in a parking lot, and show the charge status remotely. The infotainment system is entirely dependent on one’s smart phone. The system is nick-named SAMI (sort of sounds like Siri), and it stands for Smartphone Application Managed Infotainment system. Like the Tesla Roadster, the new SP:01 will have a starting MSRP well north of what a gasoline powered near-supercar costs at $135,000.00. It is hard not to point out that for that money one could buy a Chevy Volt, a Chevy Corvette Stingray, and a Chevy Spark EV. However, none of those can do 0-60 in 3.7 seconds. Tesla’s progress has clearly entered a new phase. It is now starting to see competitor’s that have a similar product, similar business plan, and similar hopes and aspirations. Detroit Electric should quickly make a press release, like Tesla’s this week, claiming their car can be had for only $500 per month if one factors in all the time the owner saves not being burdened with a gas engine.